Corrosion on metals are everywhere. Only use stainless steel and plastic pads for removal of stains. NEVER use steel wool! Rinse sink bowl thoroughly after use of detergent removing all traces of cleansing agent. Do not allow residue after sterilization process to remain in bowl. Flush thoroughly. Use chlorinated detergents ONLY as manufacturer directs. Excessive dosages can prove harmful. Never leave dirty rags or other foreign matter in sink bowl overnight. High content of chlorine in detergents are not recommended for stainless steel sink bowls. 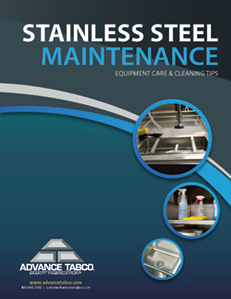 This PDF Care Guide offers vital information on how to care for your Stainless Steel Products. This information is supplied from NAFEM - The North American Association of Food Equipment Manufacturers.